This annual celebration of underground accordion culture brings together artists from around the globe for four days of squeezebox-themed concerts, dance parties, community events and cabaret. 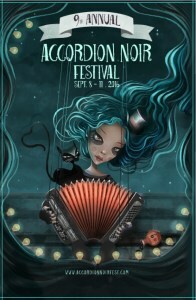 A long-time East Vancouver favourite, it showcases the best in alt accordion including cabaret, circus, folk-roots, indie, punk and klezmer. This year’s festival highlights the accordion’s deep cultural roots and features acts from Texas, Nunavut, Colombia, China and France alongside local favourites like Geoff Berner, Jack Garton and the Demon Squadron, and many more. Blending the cutting edge with the fiercely danceable, Noir Potion #9 is a four day dose of love tonic, guaranteed to cure accordion haters.